How did you learn about the Google Games? We learned about the Google Games from our professor who strongly encouraged us to join in. We hadn’t heard of it before then, but we immediately agreed to join in since it sounded like a lot of fun! We also always wanted to have the opportunity to demonstrate that deaf students are capable of great things. What did you think the Google Games would be like prior to your arrival? We mostly expected the Google Games to be a friendly competition with all the famed Google culture and style. Some of us were extremely nervous if we could take on the challenges, but it turned out that the Google Games were really fun in the end! Tell us a bit about your experience. What was your favorite part of the Google Games? The whole experience was great, particularly the trivia section, where we as a team vigorously answered trivia questions. Of course, this was all signed in American Sign Language, so you can imagine that our hands were moving actively the whole time. 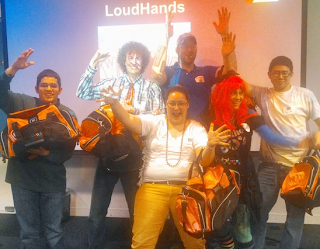 Our team name, LOUD HANDS, couldn’t have suited us any better than in the trivia section! 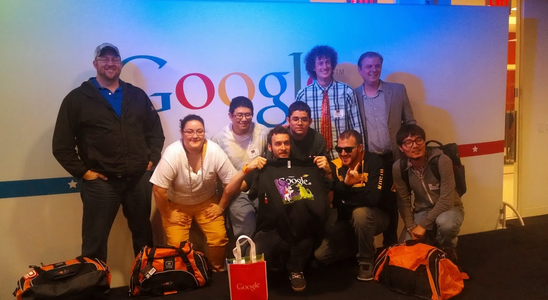 What did it feel like when they announced that your team had won the Google Games Capital City? It felt really great. We were actually very nervous before the results because although we had gotten 1st place in trivia, we came in at a very close 2nd to another team in the other two sections, building and coding, so we had no idea who was going to win. We won in the end so it was all good! And adding the fact that we are deaf, I think a lot of people were surprised at our victory. It was the greatest feeling to be able to show that there are very talented deaf professionals, specifically in coding fields. What was the biggest challenge you faced at the Google Games? 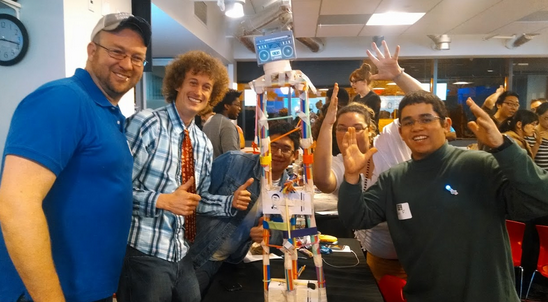 The biggest challenge was the coding category, because as three of our teammates were new to coding, either solely focusing on IT networking or were beginners, it fell upon Timothy and Larwan to take on much of the coding work. Believe it or not, Timothy completed two out of the four programming challenges all by himself, Larwan took on one himself, and the rest of us collaborated on the last one. In the end, we managed to complete three out of the four programming challenges and would probably have gotten the last one with just a little more time! What do you think was your team’s biggest asset that helped you to take the 1st place spot? Everyone contributed greatly in their own ways, but if I had to say so, it would probably have to be Timothy and Larwan’s experience and knowledge in programming that helped out greatly. Timothy was able to contribute a lot of points to our team in the Coding section, Larwan and Trudaline helped a lot in the Building section, and Wesley and Luis also supported us greatly in the Building section. Everyone contributed equally in the Trivia section. In the end, we each brought our own talents in different ways which contributed to our overall win of The Google Games. Why are students dressed in shoulder pads and parachute pants furiously building towers out of straws, answering trivia questions, coding their hearts out, and using all of their brain power to solve puzzles? Because it’s The Google Games, that’s why! The Google Games, Google’s annual invitational competition, was held at 14 locations this year and celebrated the Greats of the 1980s. This year, the Google Games came to Capital City (better known as Washington, D.C.) where students from Howard University, Gallaudet University, George Washington University, and University of the District of Columbia battled it out. This year’s Capital City winner was Gallaudet University’s “Loud Hands,” which consisted of team members Trudaline McNece, Timothy Yu, Luis Figueroa-Montanez, Wesley Layton, and Larwan Berke. We’re bringing you an insider look at this winning team, as told by team captain Trudaline, on what it takes to be the champion of The Google Games.